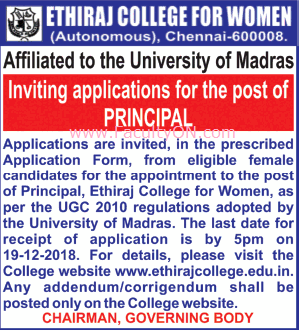 Ethiraj College for Women, Chennai has advertised for recruitment of Principal jobs vacancies. Interested and eligible job aspirants are requested to apply on or before 19th December 2018. Check out further more details below. About College : Founded in 1948, the formative years witnessed a strong foundation through introduction of undergraduate (UG) courses in Economics, Botany, Chemistry, History, Zoology and English Literature along with the infrastructural facilities, resulting in the construction of the Science Block, Hostel, Open Air Theatre and the Old Library Block. The landmark development of this decade was the auditorium, which to this day remains the pride of the College. The decade of 1968 – 1978 saw the growth of the College with the introduction of Commerce, Mathematics and Physics at the UG level, and a number of post-graduate (PG) courses and the construction of the PG block. 1. A Master’s Degree with at least 55% marks (or an equivalent grade in a point scale wherever grading system is followed) by a recognized University. 2. A Ph.D. Degree in concerned/allied/relevant discipline(s) in the institution concerned with evidence of published work and research guidance. 3. Associate Professor/Professor with a total experience of fifteen years of teaching/research/administration in Universities, Colleges and other institutions of higher education. 4. A minimum score as stipulated in the Academic Performance Indicator (API) based Performance Based Appraisal System (PBAS), as set out in the UGC 2010 Regulation in Appendix III for direct recruitment of Professors in Colleges, i.e; Consolidated API score requirement of 400 points from categories II & III of APIs (cumulative). How to Apply: Interested and eligible candidates (FEMALE only) are requested to send their application in prescribed format along with copies of certificates, testimonials and recent Passport Size photograph to the postal address mentioned below.